NOTE: Gibraltar Grill will be open for brunch on Friday, Saturday and Sunday from 9am until 3 pm starting on May 1 2015. Inside Gibraltar Grill, you can choose to sit in the dining room as you enter, or head to the screened-in porch (really a beautiful room) to the right. The “porch” is complete with cedar walls and cathedral ceiling, beautiful chandelier-style lighting fixtures, a fireplace, huge TV, and large screened windows (protected for inclement weather). The tables, covered in white linens, and chairs offered comfortable seating. This is a wonderful room indeed. In nice weather, you have the option of outdoor dining at some umbrella-ed tables – nice! In 2006, they added an additional outside area which is a U-shaped "bar" which can be used for guests waiting for a table, or in the evening for a beer or wine refreshment, and listen to the live music in season. It is, as is everything here, very well done! The outdoor bar patio area is our favorite – Gibraltar Grill continues to make improvements to their physical property, as is evidenced with the new patio bar, revamped dining room, and now with an outdoor fire pit which is great for cool evenings and fall fun. 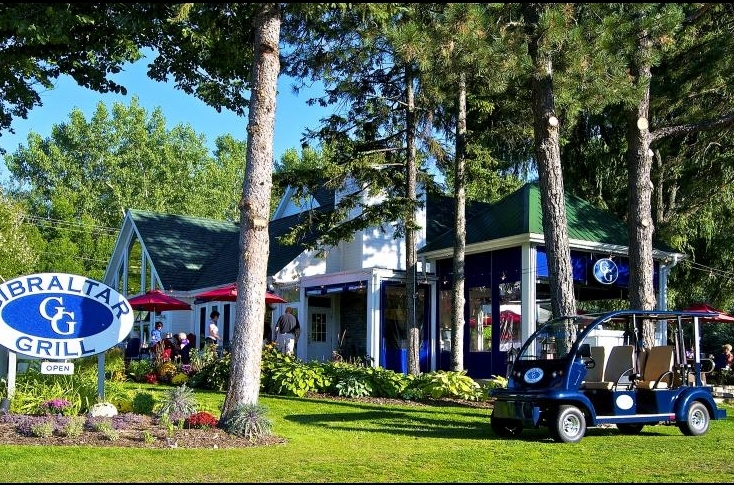 In 2011, Tom, the owner, added a cool ride - no, not an amusement park ride; he will pick you up from your hotel or dock in downtown Fish Creek, and just north too, and bring you to the restaurant, and then give you a ride back - in a 6 seater golf-cart-type vehicle - FREE! And no tips for the driver either! This is fantastic, and offers boaters a chance to dine and enjoy, and others who would like to have some drinks with their dinner, and get home safely. Great, innovative idea. We took a ride in this little beauty the other night to test it out - fun fun fun! 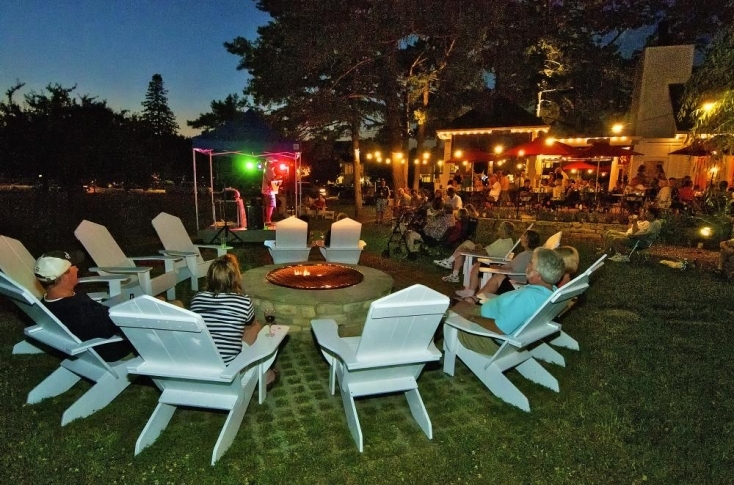 And outside, in the patio bar area, on pleasant evenings, you might catch some of the diverse entertainment that Gibraltar Grill brings in for your enjoyment – from the Birch Creek Ambassadors Jazz Ensemble to blues and oldies. We have enjoyed several wonderful evenings here, listening to music, enjoying a nice glass of wine, and relaxing! There is no charge for the entertainment. Click for schedule of entertainment! There are many choices for full entrees as well (see below). 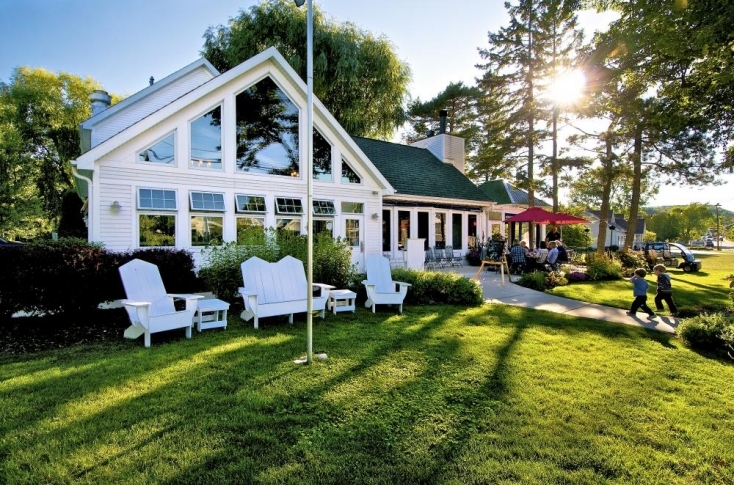 They also offer a Caesar Salad, Traditional Greek Salad, or Door County Summer Salad. For beverages, they have soft drinks, coffee, beer, and wine by the glass or bottle. Very nice selections all around. Of course, there are sandwiches and other things, and even a Gluten Free menu. Check out their whole menu online. The limited kids menu included chicken tenders, grilled cheese, peanut butter and jelly, and penne pasta . They have expanded their desserts offerings now with a whole array of scrumptious home-made items. We have eaten lunch here many, many times and have enjoyed the Stromboli, the perch sandwich, pulled pork, and burgers – all very good indeed. The Tuscan Chicken Wrap is also very good. We have also enjoy ed dinner here numerous times, and just recently enjoyed several entrees . And Now . . . More! It’s Dinner Time! To their credit, with feedback from patrons and others, they have added some wonderful dinner entrees that go way beyond the sandwich concept. For dinner now, you can choose from some appetizers, like Tom's Sampler, Hot Artichoke Dip, the guacamole and chips and more. Dinner offerings now include a seafood, turf dishes and pasta. You can also get a whitefish Roma, which we also enjoyed on one occasion - also very good; or grilled salmon or a perch platter – one of our reviewers had this on our last outing here, and it was wonderful. There are also specials - like a blackened whitefish. This dish, which we ordered on the very last outing, we elected to have both blackened and with a lemmon butter. It had a nice spicy kick to it, and a a glass of Malbec was perfect with it (yes you can have red wine with white fish - no worries)! The other reviewer had the crusty porkloin Schnitzel - which was devine. In the Turf category, choose from a certified Angus Beef featured steak, the pork loin above, Chicken Enroute (chicken breast, mushrooms, garlic in a puff pastry crust, with hunter's sauce) - we also had this on one occasion and it was awesome. The Pasta offerings included a Mediterranean Pasta (not avaialble at this time) – which is comprised of artichoke hearts, roma tomatoes, Kalamata olives, mushrooms and red onions tossed with basil pesto and grated parmesan cheese. Or try Alfredo Fettucine, or Cajun pasta with with gulf shrimp and Andoulle sausage (sound good)? You can add grilled chicken, shrimp or salmon to just about any selection too. Add a house salad or a Chef’s soup to complete your meal! Dinners come with a choice of soup or house salad, and sautéed veggies and potato of the day (expcept pasta dishes). Just recently our three reviewers ordered and sampled the Chicken Encroute (encrusted), risotto with shrimp and red peppers. The chicken was nicely done, flavorful with a sauce that made the dish delish! The risotto was a combination rice base (arborio, and others), and the scallops were done to perfection; served with a side of blanched green beans and carrots. This was our favorite dish of the night - just perfect, but the risotto and scallops are no longer available. They tweek their menus once in a while. On a recent review, our two reviewers ordered guacamole and chips as an appetizer. The homemade guac was not your typical cream cheese texture and bland flavor. This was chunky and had a little heat or kick to it. Very good. For dessert, the cheesecake stole the show. As stated above, we have dined here many times for lunch and dinner, and have brought in guests for dinner with us numerous times and we have enjoyed each and every meal here. This is a first-class place to dine indoors or out, and you will not be disappointed. For the way the place appears from the outside and inside, it begged for more – and they have responded with the new dinner offerings, plates and additional upgrades, live music and more. It has already morphed into something better than when we first visited – kudos to the owner, who we met with and discussed some of our initial concerns! We can see that this is a good family place: the food is consistently good, there’s plenty of off-street parking, and the service was quick. The owner is dedicated to making this place better and better - and it is evident with every stop. And he continues to do it! We think this place has turned into something special. A lot of effort was put into building this place and making it look wonderful. We love that the owner shifted gears already to make the place even better! We think that shows his genuine interest in serving customers. This is a comfortable place to dine for all - families or not. And you can dine indoors or out - we like to have that choice. As the business grows and refines itself, we are sure the menu offerings will continue to be upgraded and refined – he has, as we have said, already demonstrated his willingness and dedication to make things better. We love this place and dine here often. You will love it too. Family fare in a wonderful family-friendly setting. And, the outdoor patio is dog-friendly too! We have confidence in the owner and this place, and we return as often as we can! Open May – October, you can get lunch and dinner here, and even carry-outs. So give Gibraltar Grill a try and please tell Tom and the staff that DoorCountyNavigator.com sent you - that helps keep this site alive & well for you!